Wrinkles are an unfortunate phenomenon that most people face at some point in their life. They develop as a reaction to ageing, environmental influences, chemical exposure and overall health and stress. No one likes wrinkles and we all go out of our way to get rid of them. As you will learn, a face Mask can be your secret weapon if the fight against premature aging. Collagen production naturally slows down around our twenties. Once this takes place, wrinkles will form. Lifestyle choices and the environment also accelerate the development of wrinkles. With so many wrinkle-inducing elements out in the world, including the ever-so-innocent smile, it’s never too early or late to start fighting back with a complexion preserving regimen. Although wrinkles are commonly thought to be a one way transformation, they CAN be combated. Success in this battle means you must deliver a payload of wrinkle fighting ingredients to your skin daily. To facilitate this we have selected the Hydra-M Advanced Mineral Face Mask Base to use as our secret weapon. It is formulated with a multi-mineral active chrono-energizing blend of zinc, copper and magnesium. This mineral-rich mask works synergistically to improve skin vitality. Additionally Hydra-M acts as a catalyst/booster for other ingredients by prepping skin for maximum absorption. 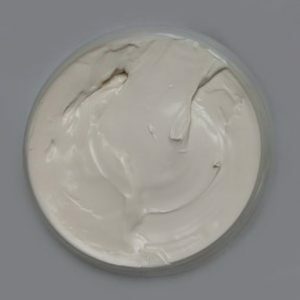 A face mask was the perfect candidate for an anti-wrinkle product because the ingredients are given time on the skin to impart their benefits. Passion Fruit Extract: Rich in Vitamins A and C, fatty acids, copper, magnesium, phosphorus, calcium and carotenoids which are vital for healthy skin. Passion fruit oil also contains several phytochemicals that help the body produce Vitamin A, reducing the appearance of fine lines and wrinkles. It also helps preserve existing collagen and elastin, thus keeping skin youthful and firm. Green Tea Extract: Derived from leaves of Camellia sinensis, Green tea extract is naturally rich in antioxidants, which protects skin from the damaging effects of free radicals. Green tea extract also contains the Methylxanthines which stimulates skin microcirculation, positively influencing the tone and health of the skin, decreasing wrinkles thereby making skin look younger. Consequently, it is useful to incorporate green tea extract into your skin care product to possibly slow down your skin’s aging process. A study from the journal of Dermatologic Surgery displayed results of measurably more elastic tissue content after continuous application of a product containing green tea extract. Biopeptide CL: Stimulates collagen and glycosaminoglycan synthesis; its activity stands comparison with retinoic acid and is thus recommended for the restructuration of dermal matrix (firming and anti-wrinkle action). Thanks to protein and glycan neosynthesis, skin grows thicker, firmer and wrinkles become smoother. Furthermore, the production of extracellular matrix also protects skin against UV rays. Plankton Extract Powder: Plankton’s high content of polysaccharides, vitamins B12 and C, proteins, and essential amino acids repair the signs of early skin aging and exert a tightening effect. In addition, plankton extract also acts against wrinkles and protects skin against harmful environmental aggressions. The Hydra-M Base has an additive load of up to 5% for extracts, so we will be sure to stay within that limit for our additions. Here are the recommended percentages for our finished product. For your convenience we have also calculated the amounts needed for a single gallon batch. Place the additives in a container with the base and cold mix until complete. Plankton extract powder may impart a green tint to the finished product. Also, if you’d like to calculate how much of each ingredient is needed for a bigger batch size, use our batch calculator and enter the percentages above.